Myth, Legend and Symbol to Inspire and Motivate. Coaching through metaphysical interpretation of mythical tales and stories. April 28 weekend at the New Living Expo in San Francisco. Weather was great, crowds were large and folks were friendly and in a buying mood. 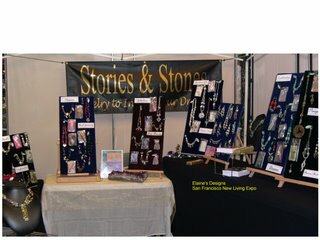 This is my latest booth set-up. It changes constantly depending on my mood and the mood of the crowd, but so far I like this one best. It's a return to the root focus of my designs - words to explain the jewelry and the myth. I started out with a similar design, did very well and changed it. Duh! Like most women, I wear many hats -writer, coach, storyteller, jewelry designer, wife, mother...you get the picture. I have a doctorate in Spiritual Psychology. Since childhood I have read every book I could get my hands on about magic, myth, dreams, legends, fairy tales, ancient wisdom, spiritual growth, goddesses, wizards and all things mystical. I've been on a spiritual path for 35 years - I still have a long way to go, but I know it's the journey that's important and not the destination. I'm a health enthusiast - study holistic health practices to stay alive, awake and aware. I'm enthusiastic, impatient and very inquisitive and intuitive. I love Scrabble, being productive and being a spiritual guide.